It’s not likely that your Synology is going to get infected with a virus of some kind. It’s also not likely that, if you’re switching to Synology from a macOS Server, that most of your clients will get infected or be using infected files. But you probably have that one Windows accounting machine in the back of the office. So you should scan your Synology routinely. To do so, Synology provides a clamav bundle, much like what I usually told people to use on macOS file servers. 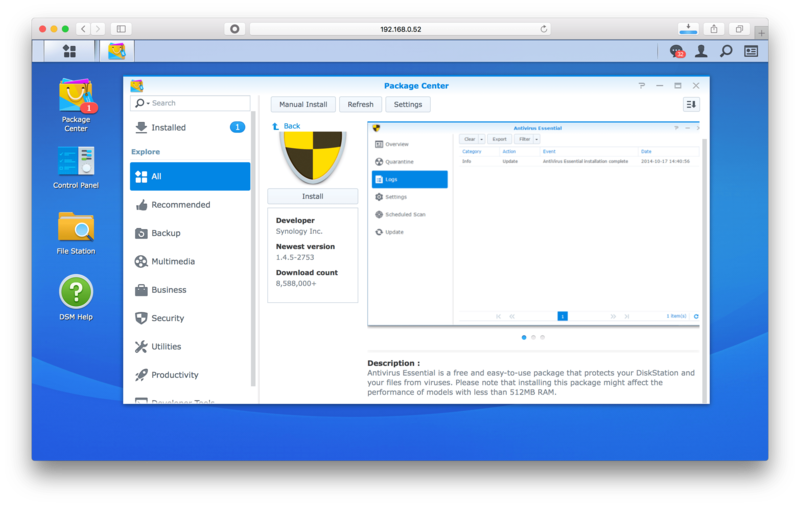 To install antivirus on your Synology, open Package Center and search for antivirus. 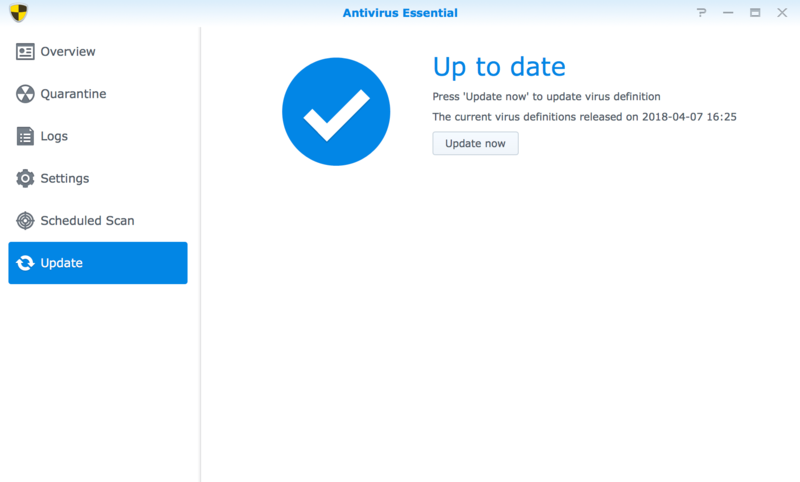 Click on Antivirus Essential and then click on Install. 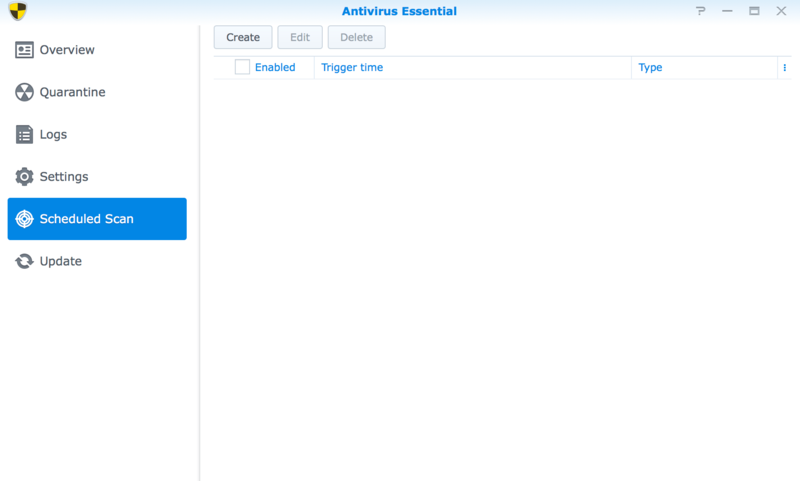 Once installed, open Antivirus Essential from the Main Menu. From here, you can perform a Full Scan, a Custom Scan (which allows you to select the shared folders to scan), or perform a System Scan (which scans everything else). To automate scans, click Scheduled Scan. At the Scheduled Scan screen, click Create. 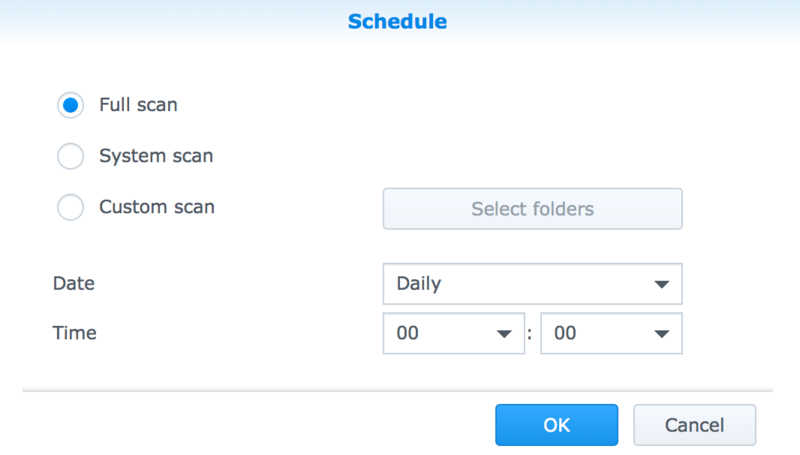 At the Schedule screen, choose the type of scan (the same options as when run manually) and when the scan should run. I definitely recommend daily scans. Then, click on OK and check the box for Enable. Click on Settings. Here, you can define what happens when an infected file is found (Quarantine is usually the best option as you can then click on Quarantine in the sidebar routinely to check on what files might have been moved). Whitelist allows you to define exclusions. Good files to exclude are Quickbooks files, and other files that aren’t very friendly to antivirus scanning, as they’re open a lot. 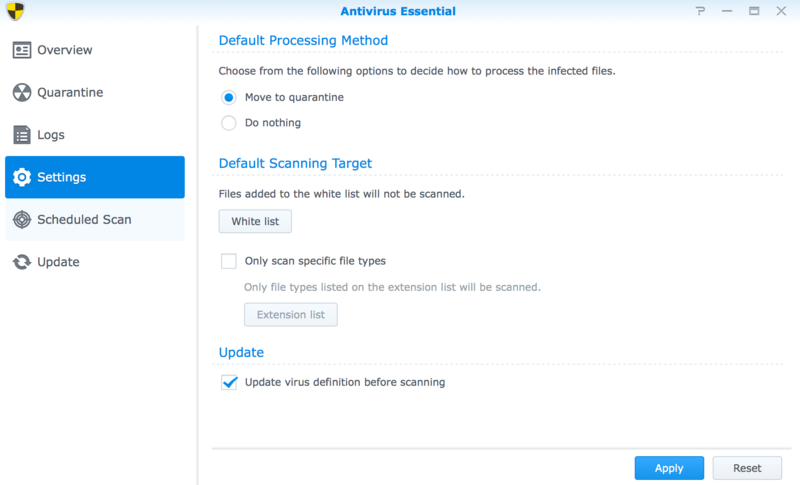 And use the Update option to have the virus definitions updated before every scan. If you ever want to check that the definitions are indeed updated, click on Update in the sidebar. 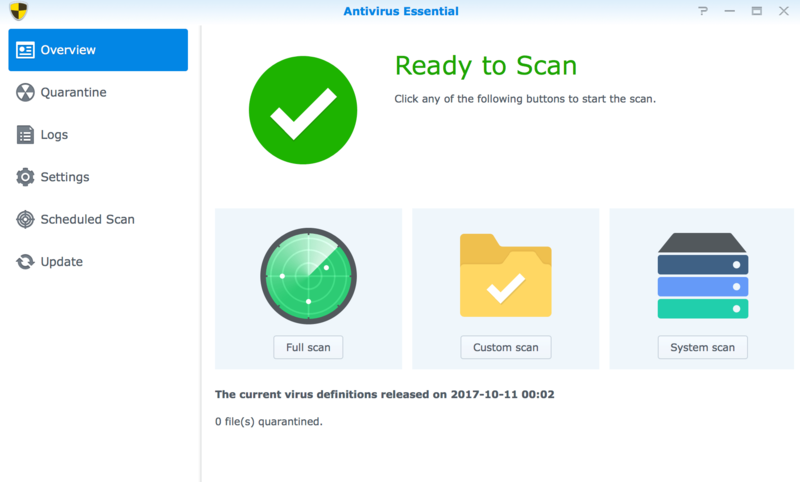 And that’s it, you’re now automatically scanning for viruses on the schedule you defined. I recommend setting a reminder to check on it every now and then. At first maybe weekly and later maybe monthly, depending on how many quarantined files are found when you check in. Just make sure the defs are up-to-date and sift through the logs every now and then and you should be good! Hey Charles, just a heads up that if you are running Time Machine on the Synology, you want to exclude the TM backup share from the Synology anti-virus scanner. Every so often a sparsebundle band file will match a virus signature, and that makes for a very unhappy Time Machine backup.